Jeeps are one of America’s most iconic vehicles with a history spanning over 70 years. Jeep: The History of Amreican’s Greatest Vehicle gives you a look at the classic vehicles throughout the years. America’s greatest vehicle is the Willys Jeep. Created out of intense prewar competition, the Willys Jeep served in World War II as a reconnaissance car, weapons carrier, supply truck, front-line ambulance, attack vehicle, ammunition hauler, and many, many other jobs. It became indispensable to American GIs and their allies around the world. Inside war-torn Europe, probably sometime in 1944: U.S. soldiers enter the bomb-blasted town of Vergato, Italy, about 40 miles southwest of Bologna. The bullet-riddled homes, rubble-filled streets, and blown-out windows testify to the ferocity of the battle to take this town. Note that the tank in the background has a plow blade attached to its front. In this rare photo we see chassis details of the Bantam Mk II. Precious few of these vehicles have survived. The 1946 Willys was America’s first all-steel family station wagon. Painted a deep maroon with wood-look contrasting paint, it mimicked the appearance of expensive wood-bodied station wagons that were the norm back then. It was handsome and practical and could hold up to seven passengers plus cargo. Army test procedures of the day called for rugged driving and basically punishing the vehicle until something broke or until the driver was worn out. Here we see an MD/M38-A1 with all four wheels off the ground. The newest member of the Jeep family of hard-working vehicles was this small DJ-3A, which was a twowheel- drive version of the earlier CJ-3A. This smart little car was available as an open roadster, convertible, or with a steel hardtop with fiberglass roof panel. These became popular as delivery vehicles for pharmacies and flower shops. As wife of a prominent Kaiser Jeep executive, Virginia Moss had her pick of the company’s offerings, and one that she enjoyed a greatdeal was this Jeep Surrey. Note the Jeep still wears Willys wheel discs, dating the vehicle to a circa 1962 model. One the most exciting Jeeps of the 1970s was the limitedproduction Hurst Jeepster, of which it’s believed only 100 were built. Shown is an all-original vehicle purchased new in California and still in the same family. This is the 1974 Jeep pickup, wearing handsome two-tone paint. Starting this year Jeep trucks were identified as J-10 (½-ton) and J-20 (¾-ton) models. Within each series, there were various chassis and suspension options. The J-20 offered GVWs up to 8,000 pounds. The definitive, fully illustrated celebration of an auto manufacturer that paved its own way by going off-road. Few American vehicles, or vehicles made anywhere else in the world for that matter, are as universally iconic as the Jeep. From olive drab WWII military relics to the beloved Wrangler with its rear-mounted spare tire, open-air design, and telltale roll cage, the Jeep is a true classic. 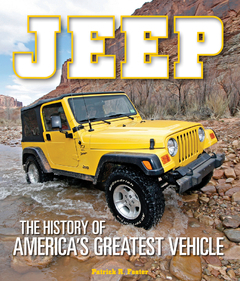 In Jeep: The History of America’s Greatest Vehicle, automotive writer Patrick R. Foster chronicles over 70 years of Jeep vehicle design and production. Beginning with the Jeep as a crucial component of the American World War II fleet, Foster expertly recounts the corporate shifts, financial struggles and successes, close calls, and, above all, the enduring machines that have carried Jeep from the early 1940s to its triumphant role as a modern-day embodiment of American perseverance. Three hundred color and black-and-white historical photos complement his expertly written narrative of Jeep’s entire history, reminding us that sometimes, the road less traveled was just waiting for the right truck.